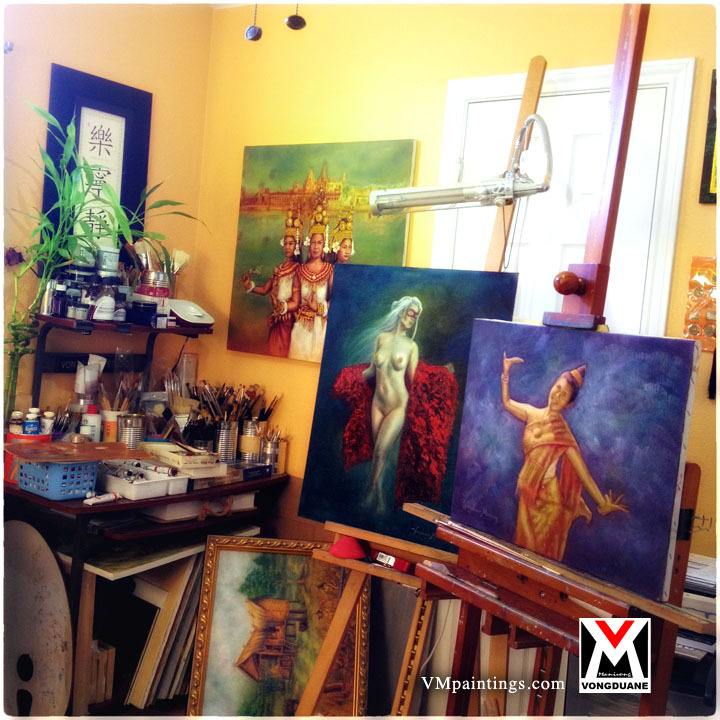 Vongduane Manivong is the preeminent voice among the first generation of Laotian-American visual artists. Her depictions of the daily lives of her people around the world form a body of work essential to understanding contemporary Laotian culture. Her work exudes a powerful style and reflects the distinct culture that shaped her. In a sense, she is a medium through which the multifaceted Laotian experience reveals itself. The children and couples, artisans and religious figures that populate her work represent a cross-section of Laotian society, and evoke the overlapping of past and present so characteristic of this rich culture. Vongduane was born in Vientiane, the capital city of Laos, and spent part of her childhood there. In 1987, she came to America with her parents when they fled the troubled country, finally settling in Dallas, Texas. The Laotian diaspora in the wake of the Vietnam War is a subtle yet poignant subtext running through much of her work. The war, which engulfed the entirety of what had once been known as Indochina, signified a torturous moment in history when tradition and modernity collided head-on. The human dimension of this history—the ordinary people immediately shaped by it and their descendants—is presented by Vongduane with great skill, dedication, and, above all, empathy. “There’s a story behind every painting I do and I enjoy sharing that story with anyone interested enough to ask about it,” she says. Vongduane’s parents were steeped in the ways of their native land. At home they spoke Lao, which she was taught to read and write as well. Her parents also brought Vongduane and her siblings up with their Buddhist religion. (Several years ago her younger brother became a Buddhist monk.) These deeply entrenched influences—really aspects of her identity—gave her the ability and motivation to further explore Laotian culture on her own.“Because of my training in Buddhism, and then my brother, who for me was like a window into daily religious life, monks became an important subject for me . . . I enjoy painting subjects from my old country, which I miss being surrounded by. I love this country, but my spirit naturally wanders back to where I was born.”Her work encompasses a variety of artistic influences, from classical to pop, but it is the emotional core of the work that resonates most powerfully. “A show of my work is like opening my diary for people to see,” she says.